Dear Reader, we have a confession: we are very old-fashioned. You know, the type who believes dessert is incomplete without whipped cream – and the more the better. 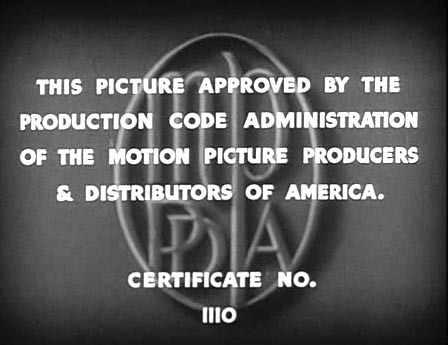 We’re also old-fashioned because we don’t entirely object to the Motion Picture Production Code. This was a form of censorship imposed on Hollywood in 1930, but not strictly enforced until 1934. With this code, Hollywood was told to tone things down because Morally Outraged Citizens objected to too much violence and other naughtiness on the big screen. One of the reasons we (as in, yours truly) don’t fully object to the code is because, unlike real life, bad guys always get What’s Coming To Them at the end of the movie. Filmmakers: Mind your Ps and Qs. However, that’s not to say that we dislike pre-code films. On the contrary, pre-code Hollywood films are fascinating: they show a creative industry in an almost-manic growth period. Sound was new, and film technology was becoming increasingly sophisticated. There is a marked difference, for instance, between movies made in 1930 and those made in 1933. Pre-code films are smart and funny, and are sometimes unflinching in their look at societal customs. 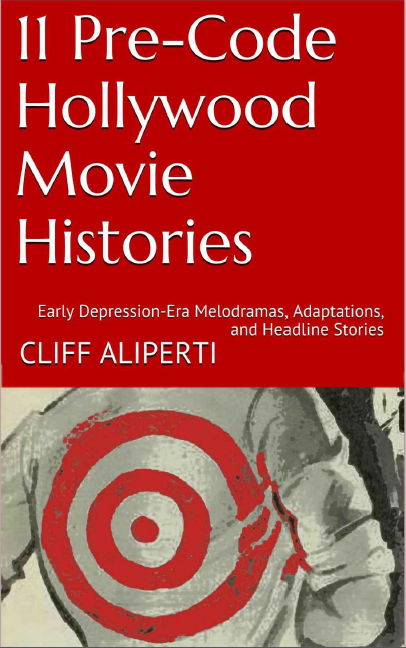 Author Cliff Aliperti examines these films in his new book, 11 Pre-Code Hollywood Movie Histories: Early Depression-Era Melodramas, Adaptations and Headline Stories. With the 11 films he’s chosen, Aliperti explores an eclectic collection, including, among others: Employees’ Entrance (1933), which is a criticism of big business; Show Girl in Hollywood (1930), an early Hollywood musical; and Call Her Savage (1932) a drama starring silent movie superstar Clara Bow. In his introduction, Aliperti gives us a background to pre-code films, which places them in context for us. “Pre-code is not a genre in film, but a period of film history,” he writes (p. 6). “Movies of [this] era often managed to approach reality in a way many later films, made under Code enforcement, could not achieve” (p. 7). Here’s an example of Aliperti’s conversational style. In describing actor Lee Tracy as “an acquired taste”, the author goes on to say “no other actor could rattle off some of these lengthy bits of bluster better than Tracy…” (p. 116-117). This is as a fair an assessment as one can give when it comes to Tracy, and a good example of the author’s appreciation of those in the film industry. Aliperti has an engaging way of describing scenes in these 11 pre-code films. His descriptions make you feel as though you’ve experienced a particular scene even if you haven’t seen the film. Clearly, he has a passion for movies and a way of “selling” them. He is careful, however, to not give away too many endings or other spoilers. He offers just enough to whet your appetite. The downside to 11 Pre-Code Hollywood Movie Histories is that some of these movies sound so good, you want to see them immediately. Sadly, a few of them are not available. (Aliperti checked.) However, he does tell us where we can see the films that are available. If you’re interested in learning more about Hollywood Pre-Code filmmaking, we highly recommend 11 Pre-Code Hollywood Movie Histories. It is available for purchase on amazon.com. Note: The author sent us a copy of this book for reviewing. Check out his blog at immortalephemera.com. Hm. This book sounds moderately irresistible . . .
And I like your phrase “moderately irresistible”. I’m stealing it. Well, hot dang! I knew I shoulda put a copyright notice on it. Sounds great – and anything Cliff writes is bound to be interesting, accurate and very well expressed. You’ve got that right! Cliff really does his research, and he always makes it lively and interesting. Thanks for slippin’ us the skinny on this, sis!! And I agree with him about Lee Tracy. I couldn’t stand him the first few times I saw him, but grew to like him. Still, having him win the likes of Jean Harlow still strains my credulity. And you know how painful THAT is!! Lee Tracy has a way of growing on a person, doesn’t he? But I agree with you re: Jean Harlow – it’s a bit much to ask. Looks like an interesting book. I actually love pre-code films. Some of my favourites come from that era. Oh yes! Films like Public Enemy No 1 and Little Caesar, and The Gay Divorcee, which I gave a HUGE soft spot for. Not to mention our Miriam’s Trouble in Paradise! Oh, The Gay Divorcee! That is, by far, my favourite Astaire/Rogers movie. I am pretty sure I could watch it every day. No, really. Every. Day. What other books has he written? I’m always interested in Pre-Code! This is his first book. Cliff says he’s working on a Vol 2, probably for Jan. w/hopes of putting out a biography in Dec. All are/will be eBooks. Thanks so much for taking the time to read and review my eBook. You’re right, for the most part I took on titles in this initial volume that I wanted to sell to potential fans–quite a few of these (Call Her Savage, Employees’ Entrance, City Streets, etc.) are personal favorites that anyone who visits is likely going to have to watch if they plead ignorance and bother to sit down! 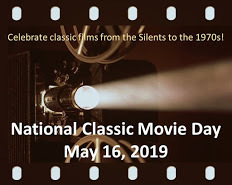 Luckily, they can all be found, some easier than others, but I didn’t want some material, such Paramount and Fox titles, to get the short shrift just because they don’t always (or ever) play on TCM. I’m so glad you enjoyed the book and, yes, I’m working on Volume 2 now, with hopes of releasing it by the end of January. A fine review of Cliff’s book! Although I love Pre-Code pics, I’m always intrigued by the innovative ways some filmmakers, such as Fritz Lang, still made their points. Agreed. Some of my all-time fave movies are pre-code flicks. Such wit and, sometimes, scathing social commentary. Thanks for dropping by! I must be old fashioned, too, as I like a lot of whipped cream on my desserts and for the bad guys to get what’s coming to them! :) But, really, I learned a lot from this post. I wasn’t aware there were pre-code and post-code films. It was interesting learning about the differences in the movies during those time periods. The book sounds like it would be very enlightening about the pre-code films. Thanks for your review, Ruth! I learned a lot, too, from this book. It has a good overview of pre-code films and what makes them different from films made in 1934 & later. It really was a unique time in film history. Thanks for dropping by, Shari, and have a great Thanksgiving!